Today is the last day when you can enjoy shopping during Valentine's Day Sale at Vera Bradley stores in the U.S. and online. 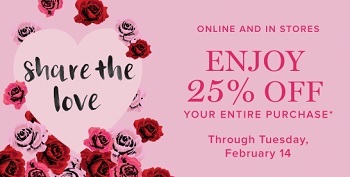 Take 25% off your entire in-store and online purchase. Excludes the Collegiate Collection and Disney-exclusive product. Source of the information is Vera Bradley. Offer is valid until February 14, 2017. More details available at Vera Bradley store locations in the U.S. and Vera Bradley online.